Health Care companies have to meet the challenges of a changing market place, with a growing population seeking ever better medical care. 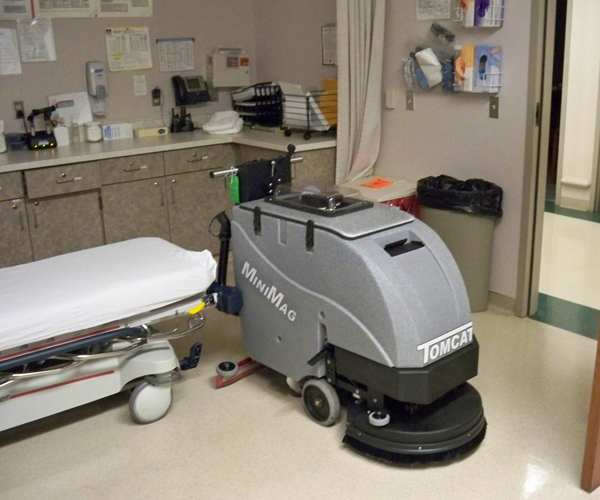 To better serve hospitals and assisted care facilities, our battery powered scrubbers have been designed to operate with the least amount of noise and make water recovery a key. Our battery-powered burnishers also operate with little noise and have excellent dust control on the burnishing pad. Hospitals operate all day, every day, so our scrubbers and burnishers are intended for use in areas that may be active with foot traffic. The scrubbers have good sight lines for the operator and standard headlights for visibility.